Crocodile Bay Resort is situated in Puerto Jimenez on the Osa Peninsula in the South Pacific. 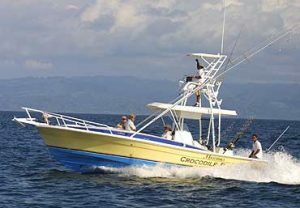 Rated Central America’s top sport fishing lodge, it occupies 44 acres with 34 air-conditioned rooms and features all-inclusive Costa Rica fishing packages with all meals; a top-of-the-line daily menu; bar; swimming pool; hot tub; massage room and conference facilities. The sportfishing fleet, easily accessed from a 750-foot pier, includes 17-foot flat boats, 24-foot center consoles, 27-foot offshore center consoles, 33-foot Strike tower boats, Boston Whalers, plus the owner’s 35-foot Strike tower boat. Ecotours also available.